Frozen vegetables are a staple in my house. Not only are they convenient, but usually have great flavor as they are frozen at the peak of their season. This quick and easy chicken pot pie pasta makes use of this convenience food and transforms it into a satisfying meal. 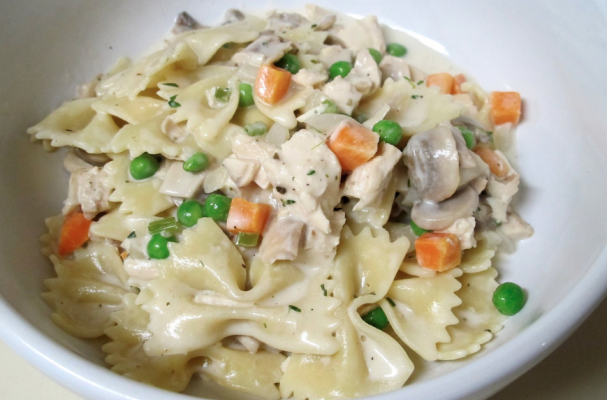 Bow tie pasta, also known as farfalle, is tossed with chunks of chicken, vegetables and a creamy white sauce. You get all the flavors of the classic comfort food in the form of a stress-free dinner. Step 1: Heat a large pot of water over high heat. Bring the water to a boil and cook farfalle as directed on the package until al dente. During the last two minutes of cooking, add the frozen vegetables to the boiling water. Drain the pasta and vegetables and set aside. Step 2: Meanwhile, heat the olive oil in a large skillet over medium high heat. Generously season the chicken with salt and pepper. Add the chicken to the skillet and cook for 7 to 10 minutes, until the chicken is no longer pink and juices run clear. Remove the chicken from the heat and set aside. Step 3: Melt 2 tablespoons of butter to any meat drippings left in the skillet and melt. Add the onion and garlic to the pan and cook until soft and onions appear translucent, about 5 to 7 minutes. Add the flour and stir to coat. Warm the chicken stock on the stove top or microwave. Slowly whisk in the chicken stock. Bring the mixture to a boil, stirring continuously, and cook until thickened, about 3 to 5 minutes. Stir in parsley and season with salt and pepper. Step 4: In a large bowl, combine the pasta, vegetables, chicken, and sauce. Serve hot.